HoneyBook's transaction fees are automatically deducted in QuickBooks as Expenses. 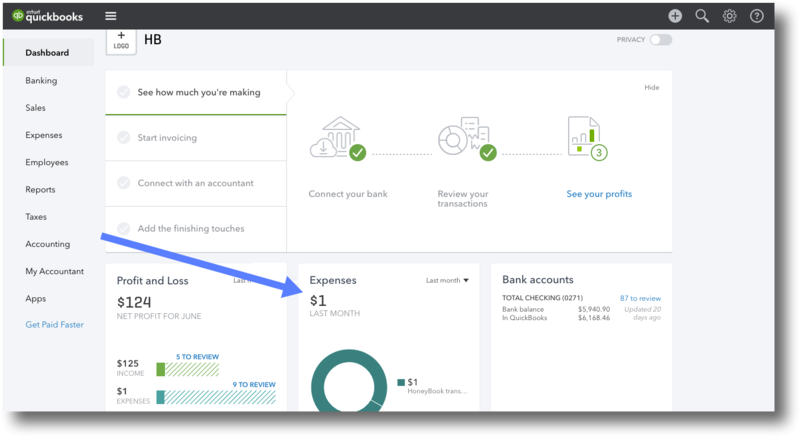 To view only these transaction fees, click the Expenses box from your QuickBooks Dashboard. Here, you'll be able to see all transaction fees, denoted as HoneyBook Transaction Fees in the description. This account will have already been created for you in QuickBooks, and you'll find all accounts listed in your Accounting tab. You can also view expenses in your Profit & Loss report in QuickBooks. In your HoneyBook account, you'll also have monthly and annual reports that you can download. These will show all payments you've received with transaction fees already broken out for you. Still have questions? Feel free to send us a message by clicking the Question Mark icon on any HoneyBook page. Our team is always happy to help!